The ancient and historic town of Yarmouth, Isle of Wight, has for many years enjoyed the privileges of having its own yacht club, for it was as long ago as 1878 that such a club was started by a few of the gentry residing in the neighbourhood. The title chosen for it was the Solent Yacht Club, which was most appropriate, for, strange as it may appear, it is the only yacht club situated on the Solent which comprises that portion of water between the Needles and Cowes. 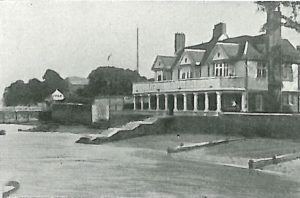 The first home of the Solent Yacht Club was in the charming old hostelry at that time called the George Inn, now the Pier Hotel. In the year 1897, however, the club was considered sufficiently strong to maintain a building of its own, and this idea was brought to a practical issue by the liberality of its Commodore, Sir Charles Seely, Bart., who generously built for the club its present ideal club-house, which stands close to the waters, and just to the eastward of Yarmouth Pier. After settling down in the new club-house steps were taken to encourage racing, and realizing the many advantages possessed by boats of one type, a special design of such most suitable for the locality was adopted, and in 1900 the fleet of Solent Seabirds became existent. In 1902 permission was given by the Admiralty for the members of the club to carry the blue ensign afloat.